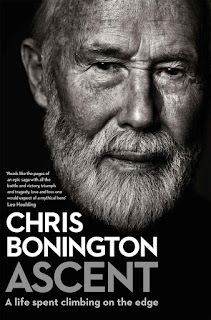 You could say Chris Bonington was one of my influences. I spent too many nineteen-seventies lunchtimes in Leeds Compton Road Library lost in the heights of I Chose to Climb and The Next Horizon, a tranquil refuge from accountancy. I acted them out on walks in Derbyshire, Scotland, the Yorkshire Pennines, the North York Moors, Iceland, Norway, France and Switzerland, an undue comparison, but I longed to be like him: all that climbing and writing. I bought a minivan, grew a beard, scrambled up mountains and tried to write things. Ascent is Chris Bonington’s definitive autobiography. Much of the content is covered in his earlier books, but, gosh, what a story! As the cover blurb says, it reads like the pages of an epic saga. The trouble is, to the non-specialist, one mountaineering expedition sounds much the same as another, even down to the extent of the senseless deaths: John Harlin on the Eiger, Ian Clough on Annapurna, Mick Burke on Everest, Dougal Haston skiing in the Alps, Nick Estcourt on K2, Pete Boardman and Joe Tasker on Everest. Their bodies often remained where they died. Bonington describes encountering Hannelore Schmatz on Everest in 1985, “sitting upright in the snow, sun-bleached hair blowing in the wind, teeth bared in a rictus grin,” where she had died of exhaustion descending from the summit in 1979. A sane person could only conclude that trailblazing mountaineering is an idiotic venture. Bonington writes in a matter of fact way. His narrative and descriptions are vivid enough, but you would be hard pressed to find a simile or metaphor anywhere in the book. It is autobiography not memoir, an accurate account of places, people and events rather than an impression or reaction to them. He comes across as self-centred. The first person “I” must appear at least 6 times on every page (as on this one! ), more than twice that on many. Yet he does not dwell on things. He is like a climbing machine with little time for imagination or self-reflection, even when writing about personal loss. At the end of the day, anyone who manages to climb the Old Man of Hoy at eighty remains an inspiration, but I’m glad I’m not like him at all. I too could not resist googling Hannelore Schmatz to find out what happened to her body in the end. Just a little more curiosity then reveals there are more than 200 bodies still on the mountain. In the case of one unfortunate chap, climbers have to step over his green-booted feet to get to the top.